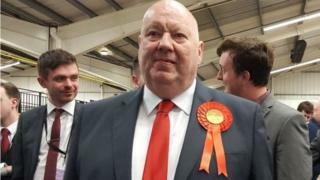 Labour's Joe Anderson has won a second term as Liverpool Mayor. Mr Anderson, who became the city's first elected mayor in 2012, won again comfortably taking 53% of the vote. Labour also retained control of Liverpool City Council but ceded two seats to the Liberal Democrats. Sefton, St Helens, Knowsley and Wirral also stayed under Labour control, as did Halton in Cheshire. The result of Merseyside's Police and Crime Commissioner election is due later. Mr Anderson became leader of the Labour group on Liverpool City Council in 2003, and headed the council when the party regained control in May 2010. He then campaigned for the cabinet system of city government to be replaced by a directly-elected mayor. Mr Anderson said he hoped to make the city more self-sufficient in his second term. "My vision is that we are sustainable in the future and not relying and dependent on government funding and we're able to look after ourselves." In Knowsley, the Liberal Democrats took three seats from Labour in Prescot North, with Labour losing three seats to Independent candidates and one to the Conservatives in Sefton. The new make-up of Knowsley Council sees Labour holding 42 of the 45 seats, with the three remaining seats held by the Liberal Democrats. One of the new Lib Dem councillors in Prescot North, Carl Cashman, told BBC Radio Merseyside: "We're a real minority but this is the start. "What people have got now is they've got a voice. "One thing people told me is you're not just standing up for Prescot, you're standing up for Knowsley," he said. There aren't many surprises in local politics on Merseyside these days - but today's local elections contained at least one shocker: The Liberal Democrats won three seats in Knowsley. Since 2012, Labour's been the only party on the council. Now, the three newly elected councillors representing Prescot North will be the opposition. The ward was created as a result of boundary changes, which saw the number of councillors cut from 63 to 45. Local campaign group First for Kirkby were just a couple of hundred votes shy of victory in Whitefield ward. Labour still holds 39 of the 66 seats on Wirral Council. Of the 23 up for grabs on Thursday, 14 were won by Labour with the Conservatives and Liberal Democrats seven and two respectively. Phil Davies, leader of Wirral Council, said: "We were defending a number of really difficult contests tonight. "We maintain our majority of 12 seats on the council and I think it's a vote of confidence for the job we've done for the people of Wirral."